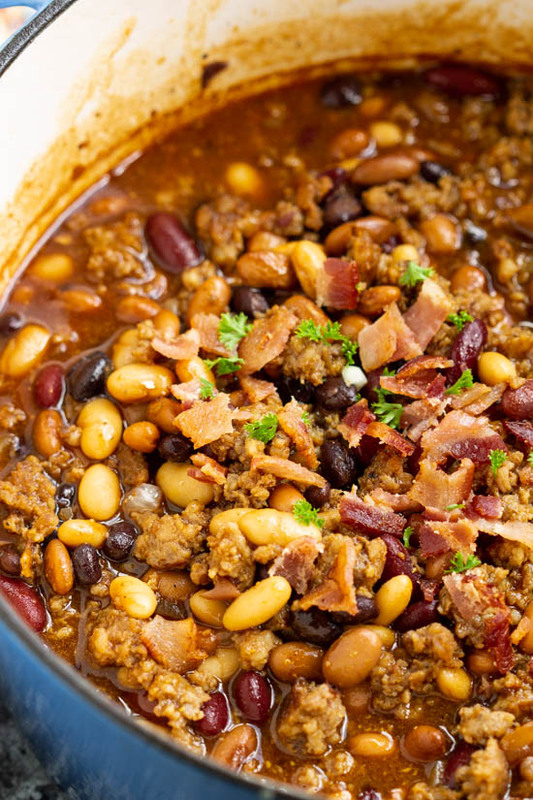 Hearty, flavorful, nutritious, and healthy, Stovetop Bourbon Bacon and Sausage Baked Beans recipe thick and meaty. 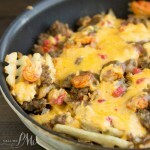 They make the perfect complement to your game day table, potluck, or barbecue all year. I’m still celebrating National Bourbon Heritage Month with Stovetop Bourbon Bacon and Sausage Baked Beans. I realize Baked Beans are largely a summer side dish with all things grilled. I like the flavorful recipe the fall. The warm, complex flavors go well with cooler fall weather and game day foods. And, Stovetop Bourbon Bacon and Sausage Baked Beans has a nice depth of flavors including bourbon, brown sugar, ketchup, Worcestershire sauce, two kinds of meats, and four different beans. I started with canned beans so there is no overnight soaking. This makes prep time quick and easy. If you’re not a fan of one of the types of beans I used, substitute your favorite bean instead. 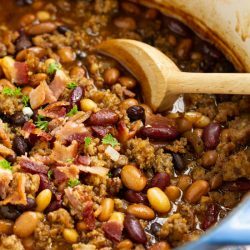 I know black beans are not traditionally used in baked bean recipes, but I like the taste of them and use them whenever I can. Do you want more of a barbecue flavor? Substitute barbecue sauce for the ketchup. I used pork breakfast sausage, but Mexican chorizo sausage would really spice up these beans. As always, adjust the seasonings to your tastes. 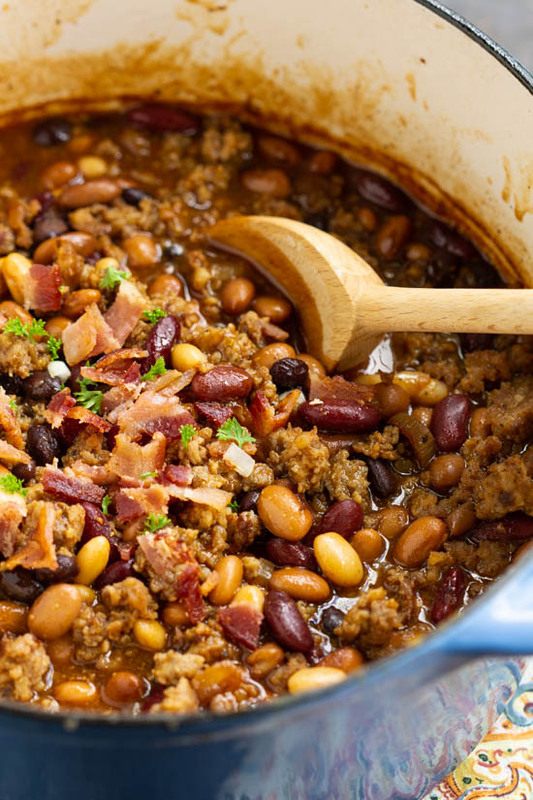 Additionally, this recipe is better after the beans sit overnight. This is perfect for parties and potlucks. Make them the day before your event and simply reheat. 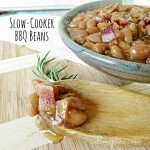 Finally, Stovetop Bourbon Bacon and Sausage Baked Beans can be made in a slow cooker. You’ll need to cook them on high 2 to 3 hours. Cook sausage, remove the sausage from the pan with a slotted spoon. Cook Bacon and remove it from the pan. Remove all but 2 tablespoons grease from the pan. Add onion and cook 3 to 4 minutes. Add garlic and cook 1 minute. Add sausage back to the pan along with all the ingredients EXCEPT the bacon. Stir to combine. Uncovered, bring to a boil. Boil 1 minutes. 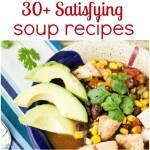 Reduce heat to simmer and cook 40 to 45 minutes. Chopped bacon and add it to the pan with other ingredients. Garnish with sliced green onions if desired. Serve warm. Join my Facebook Group, I’m always sharing amazing creations. Can you please inform me as to where to get “Ground Red Pepper”? And what type of Paprika is it? Thanks in advance. I’m planning on making this; it sounds wonderful. Could you please explain the molasses bourbon to me as I am not familiar with it and , also, if there is something to substitute as I live in Canada and buying bourbon for 1 recipe would make very expensive beans. 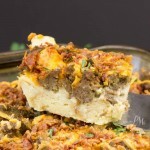 I would really like this for a potluck. Oh goodness, that’s my mistake! It’s supposed to be 1/4 cup molasses and 1/4 cup bourbon (or whiskey). So sorry, but that you for commenting so that I saw it. I have it corrected now. Paula, you just solved my Monday dinner problem ! Thank you so much ! Hi Paula, I love your recipes. Thanks for sharing them. I was wondering, what is molasses bourbon.? I am very anxious to try the beans. My fingers had a mind of their own apparently, so sorry. It should be 1/4 cup molasses and 1/4 cup bourbon (or whiskey). I have it corrected now on the post. All the right ingredients. Most people don’t know that you need both ketchup and mustard in good baked beans. 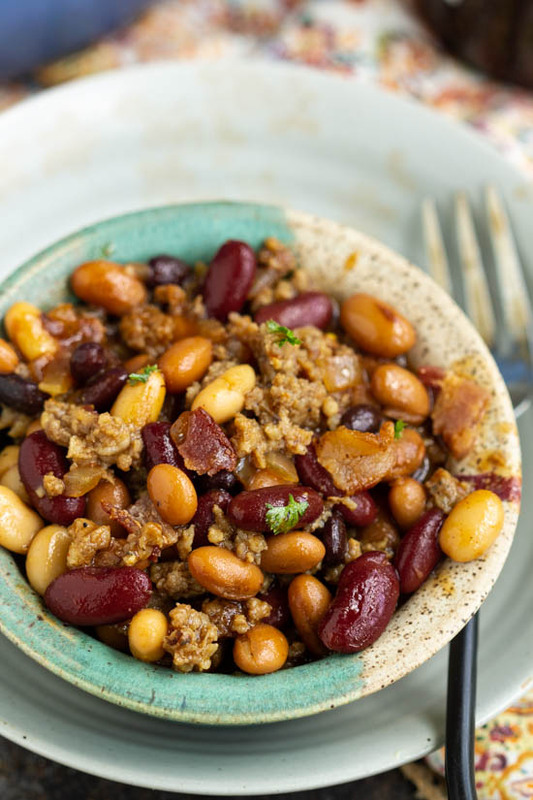 This is equally good simmering for a few hours in a slow cooker, which allows the beans to really soak up the seasoning. All I add is a large spoonful of tomato paste to thicken the sauce.